Gonadotropin-releasing hormone agonist (GnRHa) trigger for final oocyte maturation in gonadotropin-releasing hormone antagonist (GnRHA) protocol has been a revolutionary tool in the armamentarium of assisted reproductive technology. The GnRHa trigger effectively results in the induction of final oocyte maturation  and ovulation, in comparison with the standard human chorionic gonadotropin (hCG). GnRHa trigger has been a boon in polycystic ovarian syndrome (PCOS) patients undergoing in vitro fertilization (IVF) cycles, as it significantly reduces or nearly eliminates the risk of ovarian hyperstimulation syndrome (OHSS) due to its shorter half-life.,,, However, there have been concerns regarding the effectiveness of GnRHa to yield optimal mature oocytes, with a few cases of empty follicle syndrome (EFS) and immature oocyte syndrome being reported.,, This has led to the clinicians been skeptical of using GnRHa as the trigger of choice even in indicated cases such as PCOS and hyper-responders. The gonadotropin response following GnRHa trigger has a much shorter duration when compared to that of an endogenous LH surge in a natural cycle.,, As a result of this, the expected response might be suboptimal. Hence, a single dose of GnRHa might not be able to induce an LH surge above a threshold level and for a threshold duration (mimicking physiological surge) that is required for adequate oocyte maturation, more so in women with PCOS who exhibit neuroendocrine abnormalities. Additionally, in PCOS due to the priming effect of pituitary gonadotropes by the supraphysiological estradiol concentrations, marked increase in the number of follicles, and inadequate number of luteinizing hormone (LH) receptors (in particular the intermediate and small follicles), a single dose of GnRHa could possibly be insufficient to yield an optimal response. 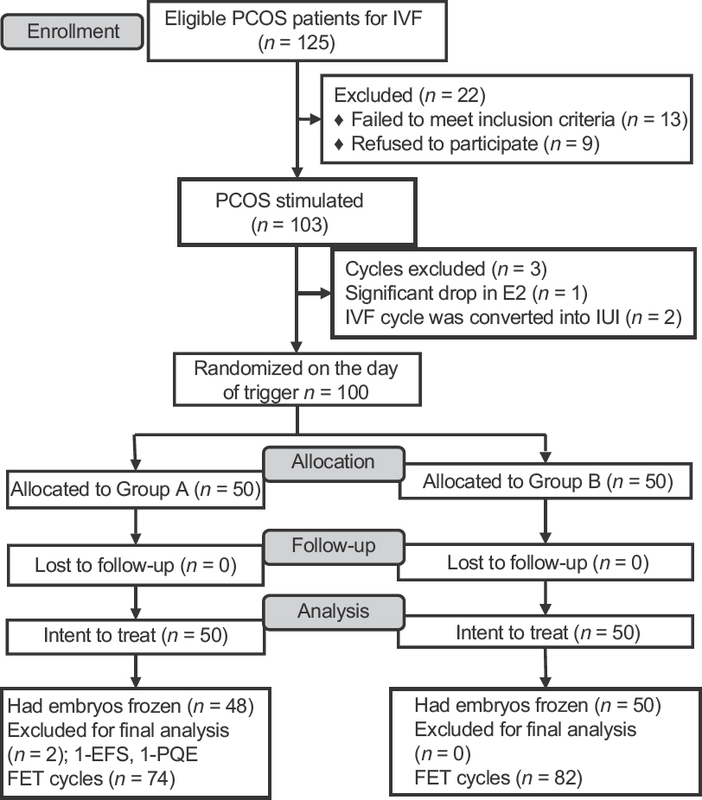 The aim of this study was to establish if a second dose of GnRHa repeated 12 h following the initial dose optimizes the cycle outcome in terms of oocyte maturity in women with PCOS of Asian origin. This prospective, randomized, double-blinded study was conducted at a university-affiliated tertiary care center. A total of 125 patients diagnosed with PCOS, undergoing IVF in an antagonist protocol between June 2014 and December 2016, were recruited for the study. The study followed the Consolidated Standards of Reporting Trials guidelines for reporting of randomized controlled trials (RCTs). All participants before allocation signed an informed consent form. Approval was obtained from the Institutional Ethical Committee (ECR/773/INST/KA/2012). The primary end point was the number of metaphase II (MII) oocytes. Sample size calculation was performed to detect a difference in the mean number of MII oocytes between the two groups. A sample size of 42 in each group was estimated with an assumption of obtaining a mean difference of 5 MII oocytes, with 0.05 probability of type I error and power of 80%. Accordingly, a sample size of 100 (50 in each group) patients was needed to be randomized, taking into account the dropouts. Inclusion criteria were - (i) All PCOS defined as per the ESHE/ASRM Rotterdam criteria  undergoing their first cycle of IVF; (ii) aged 21–35 years; (iii) normal early follicular phase serum FSH concentration (<8.0 IU/L); (iv) body mass index (BMI) >18 and <30 kg/m2; (v) both ovaries present; (vi) indication for IVF or intracytoplasmic sperm injection (ICSI); (vii) stimulation in a GnRH-antagonist protocol; and (viii) willingness to participate in the study. Exclusion criteria were - (i) Age >35 years; (ii) cycles triggered with hCG; (iii) donor cycles using GnRHa trigger; (iv) severe male factor infertility; (v) patients with hypogonadotrophic hypogonadism; and (vi) uterine abnormalities. Patients were recruited for the trial for only one cycle. Patients were randomized on the day of trigger by a computer-generated sequence with sealed opaque envelopes into two groups of fifty each [Figure 1]. Group A: single dose of GnRHa 0.2 mg, 35 h prior to oocyte retrieval, and Group B: 0.2 mg of GnRHa 35 h prior to oocyte retrieval + repeat dose of 0.1 mg 12 h following the first dose. GnRHa: triptorelin acetate (decapeptyl) was administered at least 12 h after the last dose of GnRH antagonist. The study nurse coordinated the randomization process and distribution of medication. The clinician, embryologist, and the statistician were blinded as they were unaware of the treatment group. All PCOS patients recruited for the study were pretreated with oral contraceptive pills in the previous cycle. Prior to starting stimulation, estimation of day 2/3 follicle-stimulating hormone (FSH), LH, estradiol (E2), progesterone (P4), anti-Mullerian hormone (AMH), and a baseline transvaginal scan were performed in all the patients. Controlled ovarian stimulation was started with recombinant FSH (Gonal-f ®, Merck-Serono) in the dosage of 112.5–175 IU per day for 4 days from cycle day 2/3 according to age, BMI, antral follicle count, AMH, and previous ovarian response to stimulation. Thereafter, the dose was adjusted on the basis of ovarian response and serum E2. Flexible multiple dose protocol was followed wherein GnRH antagonist-Ganirelix (Orgalutran, Organon) 0.25 mg/day subcutaneous (s.c) was started when the lead follicle was ≥14 mm and/or serum estradiol concentration was >300 pg/mL. Both gonadotropin and antagonist were continued till the day of trigger. Follicular development was monitored by transvaginal sonography (TVS) using a 4–8 MHz vaginal probe (Aloka, Prosound 6). On the day of trigger, serum E2, LH, and P4 concentrations were measured. When three lead follicles achieved 17-mm diameter, the final oocyte maturation was triggered with a single dose of 0.2 mg s.c triptorelin (decapeptyl, Ferring) 35 h prior to oocyte retrieval in both the groups and in Group B, a repeat dose of 0.1 mg 12 h following the first dose. We preferred using triptorelin as GnRHa trigger, as currently, most IVF cycles in Asia and Europe are triggered with triptorelin., Post-trigger, LH, FSH, and progesterone levels were measured 12 h following the first dose of GnRHa. Transvaginal ultrasound-guided oocyte pickup (OPU) was performed 35 h following the first dose under intravenous sedation with single-lumen oocyte retrieval needle (Swemed, Vitrolife). Coasting was not done in any patients. No other intervention for the prevention of OHSS was undertaken. Postpickup on days 4 and 7, an assessment for symptoms and signs of OHSS and a transvaginal sonography to assess the ovarian size, free fluid in pouch of Douglas, paracolic gutters, Morrison's pouch, and pleura was performed. However, in case of symptoms such as abdominal distension/pain, vomiting, and difficulty in breathing, patients were advised to present at any time within 2 weeks of GnRHa administration. In all cases, intracytoplasmic sperm injection (ICSI) was the mode of fertilization as per the standard operating procedure of the hospital. Fertilization was assessed 18 h following ICSI by the appearance of two pronuclei. Embryos were graded as per the Istanbul consensus; cleavage-stage embryos, Grade 1 (G1) (good): <10% fragmentation, stage-specific cell size, and no multinucleation. Grade 2 (G2) (fair): 10%–25% fragmentation, stage-specific cell size for majority of cells, and no evidence of multinucleation. Grade 3 (G3) (poor): severe fragmentation (>25%), cell size not stage specific, and with evidence of multinucleation. Blastocysts were graded as follows: 1 – early; 2 – blastocyst; 3 – expanded; 4 – hatched/hatching; inner cell mass: 1 (good) – prominent, easily discernible, with many cells that are compacted and tightly adhered together; 2 (fair) – easily discernible, with many cells that are loosely grouped together; 3 (poor) – difficult to discern, with few cells; trophectoderm: 1 (good) – many cells forming a cohesive epithelium; 2 (fair) – few cells forming a loose epithelium; 3 (poor) – very few cells. All embryos were cryopreserved by vitrification as described by Kuwayama et al. An open system using cryolock with 15% ethylene glycol, 15% dimethylsulfoxide (DMSO), and 0.5 mol/L sucrose as cryoprotectants (SAGE ® vitrification kit, Origio) was used to vitrify the embryos. Blastocoel was collapsed with the help of laser (Octax, MTG) and then vitrified using the same protocol, as described for day-3 embryos. As a policy, at least 50% of 8 cell Grade 1 (CG1) and G2 embryos were cryopreserved, G3 embryos being discarded, and the remaining of G1 and G2 were cultured to blastocyst and frozen. All frozen embryo transfer (FET) cycles were performed following pretreatment with oral contraceptive pill in an artificial cycle with a daily dose of orally administered 6 mg of estradiol (Progynova; Zydus Cadila). When the endometrium evaluated by TVS was >8 mm with triple-layer morphology, it was considered mature. This was followed by endometrial priming with 3 days of injectable progesterone (gestone 50 mg; Ferring) for cleavage embryos and 5 days for blastocysts. If the endometrial thickness was <7 mm on day 9, transdermal preparation of estradiol (Oestrogel, Besins) was added and the dose of progynova was increased to 12 mg. If the endometrial thickness remained <7 mm in spite of prolonged estradiol priming (with a maximum of 7 days' additional estrogen supplementation), the cycle was canceled. Embryos selected for transfer were thawed on the day of transfer using 1.0 M sucrose (Sage-thawing kit, Origio). Following thawing, embryo quality was assessed by morphologic evaluation. For cleavage embryos, blastomeric survival of ≥50% (with clear cellular boundaries and no degeneration) and for blastocysts, the ability of the blastocoel to reexpand within 2–6 h postthaw was identified as a live embryo. If not, the embryos were taken as failed to survive and were discarded. Embryos that survived the thaw were placed in a culture medium until transfer was performed. Survival rate of the embryos following thawing was calculated as the number of viable embryos to the number of those thawed. The maximum number of embryos thawed and transferred per FET cycle was three in cleavage embryos and two in blastocysts. The transfer was performed under ultrasound guidance using Sure-Pro Ultra catheter (Wallace). Luteal-phase supplementation was continued with vaginal progesterone and estradiol for 14 days and when pregnancy was achieved till 10 weeks of gestation. Serum levels of FSH, LH, E2, and P4 were measured using an automated electro-chemiluminescent immunoassay system (Roche Cobas e411). The assay sensitivity for FSH and LH was 0.1 mIU/mL and linearity was 200 mIU/mL. The coefficients of variation (CV) with intra- (CVw) and inter-assay (CVb) coefficients were 1.8% and 1.8% and 5.3% and 5.1%, at a mean value of 1.2 and 103 mIU/mL, respectively, for FSH. Similarly, for LH, the CVw and CVb were 1.2% and 0.9% and 2.0% and 2.2%, respectively, at concentrations of 5.81 and 159 mIU/mL. The CVs for estradiol were 5.7% and 1.9% and 6.2% and 2.8% for levels of 34.8 and 1018 pg/mL, respectively. The minimum detection limit for serum E2 was 5.0 pg/mL and linearity was up to 4300.0 pg/mL. AMH was measured using generation 2 ELISA kit (Beckman Coulter, sensitivity: 0.08 ng/mL, linearity: 0.16–22.5 ng/mL), having CVw of 5.4% and 3.6% and CVb of 5.6% and 4.5% at concentrations of 4.42 and 14.03 ng/mL, respectively. Maturity rate of the oocytes: oocyte maturity was defined as the ratio of MII oocytes (presence of a polar body) to the total number of oocytes retrieved. Optimal oocyte maturity was defined as >75% and poor oocyte maturity was defined as <75%. The secondary outcomes were oocyte yield, fertilization rate, blastocyst conversion, OHSS rates, and post-trigger serum LH (IU/L), FSH (IU/L), and P4 (ng/mL) levels. Oocyte yield was defined as the ratio of the total number of collected oocytes to the total number of follicles >12 mm on the day of oocyte pickup. Fertilization rate was defined as the ratio of normal fertilized oocytes (2 pronucleases) to the number of MII oocytes. Following thawing, survivability rate of the embryos, implantation, and clinical pregnancy rates were also evaluated. Implantation rate was defined as the number of gestational sacs visible on TVS divided by the number of embryos transferred per patient. Clinical pregnancy was defined as a positive serum beta-hCG (b-hCG) with transvaginal sonographic evidence of a gestational sac with fetal heart beat at 6 weeks of gestation. Data were analyzed using the Statistical Package for the Social Sciences version 16.0 (SPSS, USA). Continuous variables were expressed as mean ± standard deviation and categorical variables as proportions where applicable. Statistical analyses were performed using the Chi-square test or Fisher's exact test for categorical variables where appropriate. Independent sample t-test was used for continuous variables which were normally distributed and Mann–Whitney U-test for data nonnormally distributed. Odds ratio (OR) with 95% confidence intervals (CIs) was calculated. P < 0.05 was considered statistically significant. In addition, receiver operating characteristic (ROC) curve was used to evaluate the post-trigger values at 12 h of LH (LH12), P4, and FSH following the first dose as predictors of oocyte maturity. The participant flow is depicted in [Figure 1]. Of the 125 eligible PCOS patients screened for the study at our center, 103 underwent stimulation for IVF cycle in an antagonist protocol. During stimulation, cycles in three patients were canceled before trigger. For the final analysis, two patients in Group A were excluded; one patient had EFS and in the other patient, all oocytes had cytoplasmic abnormalities resulting in poor quality embryos. Accordingly, 156 FET cycles (74 in Group A; 82 in Group B) took place. A total of 98 patients underwent the first FET cycle, 49 patients underwent the second FET, and 9 patients underwent the third FET across the groups. The age, parity, causes, duration of infertility, and seminal parameters were similar in both the groups [Table 1]. Majority of the patients had primary infertility (76% in Group A and 82% in Group B), with anovulation as the prime cause of infertility in about 38% in Group A and about 44% in Group B. The duration of stimulation and the total dosage of gonadotropins were similar in both the groups. The number of dominant follicles ≥17 mm was observed to be significantly greater in Group A than in Group B [Table 1]. [Table 2] shows the outcomes in both the groups. 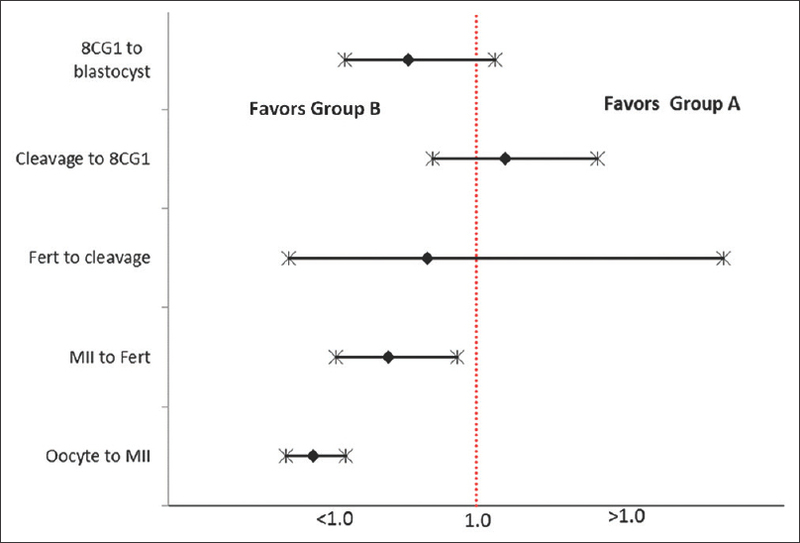 A higher number of MII oocytes were obtained in Group B than in Group A, with statistically significant odds favoring Group B [Table 3], although the average number of oocytes retrieved was statistically greater in Group A [Table 2]. In addition, there was a significantly lower number of MIs (2.76 ± 1.36 vs. 4.78 ± 2.90; P < 0.01) and Germinal vesicle (GV)s (0.64 ± 0.99 vs. 1.84 ± 3.17; P = 0.012) in Group B when compared to Group A. The odds favored Group B significantly in the conversion of oocyte to MII and MII to fertilization [Table 3] and [Figure 2]. A higher fertilization rate was observed in Group B than Group A. The odds for fertilization to cleavage and cleavage to 8CG1 did not statistically favor either of the groups specifically [Table 3]. However, because of improved odds in the initial two steps, there was a statistically significant higher number of blastocysts obtained in Group B than Group A [Table 2]. The 12 h post-trigger FSH, LH, and P4 values were the same in both the groups. In FET cycle, the mean endometrial thickness in both the groups was 8 ± 2 mm. The mean survival rate of thawed embryos was 79% ± 20% and the odds for survivability of embryos was as follows: OR = 1.49; CI: 0.95–2.35; P = 0.08. In total, 336 embryos were transferred, with 225 blastocysts and 111 cleavage-stage embryos replaced in 156 cycles across the groups; 74 FET cycles in Group A and 82 FET cycles in Group B. The number of frozen-thawed embryos transferred per cycle was comparable in both the groups (2.06 ± 0.245 vs. 2.02 ± 0.319, P = 0.46). A similar number of blastocyst transfers took place across both the groups, with 106 in Group A and 119 in Group B. There was no significant difference in the implantation rates between the two groups. The average number of FET to achieve a clinical pregnancy was similar in both the groups (1.52 vs. 1.62; P = 0.382). The odds of clinical pregnancy per patient were higher in Group B (OR = 0.56; CI [0.27–1.24]), with a trend toward better clinical pregnancy in Group B than in Group A [Table 3]. The LH surge in a natural cycle lasts 48 h and consists of three phases: ascending phase (14 h), plateau phase (14 h), and a descending phase (20 h). On the contrary, the LH surge induced by GnRHa is shorter, lasts for 24 h; consisting of only two phases: a short ascending phase lasting for ~4 h and a descending phase lasting ~20 h. Thus, the effective duration of action is shorter with a lower amount of gonadotropins (LH and FSH) being released when compared to natural cycle., It is known that the expansion of cumulus cells and resumption of meiosis begin 18 h after the onset of LH surge  and that the LH concentration must be maintained above a threshold for 14–27 h to maximize the oocyte maturation. Hence, a single dose of GnRHa might not be able to maintain an LH concentration above a threshold for 14–27 h, sufficient to induce optimal oocyte maturation, may be due to its shorter duration and lower LH levels post-trigger. It has been reported that repeated injections of GnRHa increase the duration of LH secretion (LH level was >100 IU/L) up to >14 h. Theoretically, a third or even a fourth administration may improve the amplitude and duration of the resultant endogenous gonadotropin surge, which is practically neither feasible nor cost effective. The LH concentration peaks to levels of 130 ± 60 IU/L at 4 h with triptorelin and 107 ± 55 IU/L with leuprorelin, falling to 40 ± 20 IU/L at 12 h reflecting its clearance, with levels returning to baseline after 24 h. Thinking in the same lines, we postulated a repeat dose of GnRHa at this crucial hour (12 h) could maintain the amplitude and the duration of gonadotropin surge, thereby optimizing the oocyte maturity. There is clearly a subgroup of patients who respond poorly following GnRHa trigger, with decreased oocyte yield, maturity, and quality. This has been explained by an inadequate LH surge (magnitude and/or duration) and possibly, inadequate FSH surge leading to suboptimal signaling at the level of the follicles resulting in failure to achieve the final oocyte maturation. As the pituitary gland is the site of action for GnRHa, any temporary or permanent dysfunctions of the hypothalamic–pituitary–ovarian (HPO) axis might not produce optimal flare effect, resulting in deficient final follicular maturation. Hence, women with hypothalamic amenorrhea are not the candidates for GnRHa trigger. A yet another subset of population who could be at risk of suboptimal response following GnRHa trigger is in women with PCOS, a condition with HPO axis dysfunction. Furthermore, in these high-responder patients because of the phenomenon of self-priming of gonadotroph cells in the pituitary by high E2 concentrations, the expected response in relation to gonadotropin secretion could be suboptimal. Furthermore, the resultant endogenous LH (and FSH) action on the follicular cells could be inadequate, given the increase in the number of intermediate follicles and possibly the inadequate neovascularization surrounding these follicles, which leads to suboptimal delivery of the gonadotropins. We therefore hypothesized that in this subset of population with PCOS, a repeat dose of GnRHa could optimize the oocyte maturity and thereby the cycle outcome. We chose segmentation strategy, freezing all the embryos in both groups, followed by frozen-thawed embryo transfer in the subsequent hormone replacement therapy (HRT) cycle. Fresh embryo transfer was deferred to prevent early and late-onset OHSS, impaired endometrial receptivity due to supraphysiologic steroid levels, and concerns of luteal-phase deficiency with lower implantation and ongoing pregnancy rates. In addition, the advent of vitrification has enabled us in obtaining a high survivability of embryos and significantly higher ongoing pregnancy rates, with better obstetric and perinatal outcomes. In a preliminary commendable work by Itskovitz et al. in 1991, even before the advent of antagonists, they reported that a bolus dose of GnRHa was able to trigger an adequate mid-cycle LH/FSH surge, resulting in oocyte maturation. In the same study, involving 14 patients (6 normal responders and 8 hyper-responders), the group also reported that a second injection of GnRHa had no effect on LH release, at least as reflected in the serum levels of LH, 2 hours after its injection, suggesting that pituitary desensitization had already occurred 12 h after the first injection. This study involved the use of gonadotropins only without the occupation of GnRH receptors on the gonadotrophic cells by the antagonist for the agonist to displace allowing reevaluation of stimulating a mid-cycle rise in endogenous LH. Under these circumstances, the dynamics and endocrine profiles of the mid-cycle gonadotropin surge could vary. Further studies have proven that the hormone profiles consistent with pituitary suppression occurred by day 6 of GnRHa administration. Thus, as evident in our study, the continued flare effect lasting for the next 24 h with a repeat dose of GnRHa 12 h following the first dose resulted in a better oocyte maturity. This could have been correlated biochemically as well, which is a limiting factor. A rise in serum LH and progesterone following GnRHa trigger indicates that an endogenous flare has occurred and oocyte maturation has been initiated., Hence, we also evaluated the post-trigger LH, P4, and FSH at 12 h as a predictor of oocyte maturity. In a retrospective study by Shapiro et al., a diminution in oocyte maturity was seen when LH levels measured at 12 h post-trigger were <52 IU/L, with a dramatic decrease when LH12 was <12 IU/L in hyper-responders and oocyte donors. In our study involving PCOS patients, a post-trigger LH12 of 40.69 IL/L predicted oocyte maturity with a sensitivity of 84% and specificity of 72.2% and the area under the curve to predict this maturity was 0.848 [Figure 3]. However, the post-trigger FSH and P4 values at 12 h were not predictive of oocyte maturity. Further, a repeat post-trigger measurement of LH at 12 h following the second dose would help to validate the hypothesis if LH and FSH levels were sustained, which would associate with better outcomes in Group B. This was not done in our study due to additional costs involved and burden to the patients, which are limiting factors. We encountered one case of EFS with an incidence of 1/100 (1%), which is similar to that occurring following hCG trigger of 0.1%–3.1%.,, In the indexed case, despite the presence of about 18 preovulatory follicles on the day of trigger with peak E2 = 4800 ng/mL, LH = 1.64 IU/L, and P4 = 1.21 ng/mL, no oocytes were obtained following aspiration of six dominant follicles in one ovary. The procedure was abandoned, cycle rescued with recombinant hCG 250mcg (Ovitrelle, Merck Serono) and an oocyte pickup 35 h later retrieved 11 oocytes. Here, the post-trigger values of LH and P4 at 12 h were 9.71 IU/L and 2.8 ng/mL, respectively. Earlier reports have shown that patients with EFS have a suboptimal post-trigger serum LH levels of <15 IU/L and progesterone levels of ≤3.5 ng/mL., This was a case of pseudo EFS, probably due to inappropriate drug administration as a result of human error resulting in a suboptimal LH surge. Comparatively lower levels of post-trigger values could have alerted us, averting this complication. This still could be a random occurrence, and further studies in larger groups would help us to define an appropriate LH and P4 cutoff as a predictor of EFS following GnRHa trigger. Our study demonstrates a trend toward better fertilization, higher number of G1 embryos available on day 3 and better blastocyst conversion, yielding a greater number of blastocysts in Group B. Following transfer of frozen embryos in the subsequent HT cycle, a trend toward a higher clinical pregnancy rate was observed in Group B (58% vs. 44%) who received a repeat dose of GnRHa 12 h later, though not statistically significant. We encountered no cases of mild, moderate, or severe OHSS (0%) in both the groups aborting OHSS completely. Furthermore, the patients followed up on days 4 and 7 following oocyte retrieval were totally asymptomatic and none had nausea, vomiting, abdominal distension/pain, or breathlessness, resulting in higher patient convenience during the luteal phase. Our study reemphasizes the implementation of GnRHa trigger with antagonist protocols in PCOS undergoing IVF for an OHSS-free clinic. 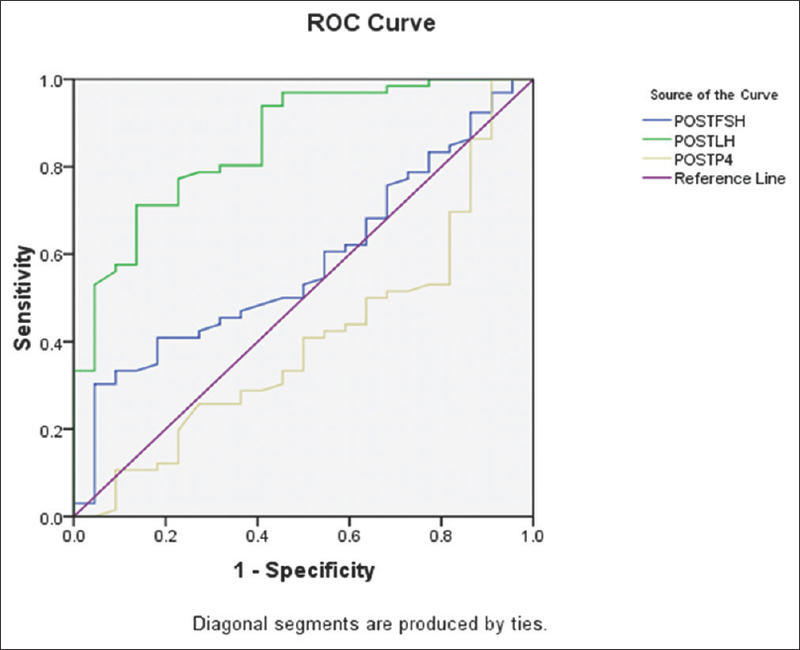 The strength of the present study is that it is a proof-of-concept RCT to explore if a repeat dose of GnRHa in PCOS undergoing IVF in GnRH antagonist cycles would optimize the cycle outcome. 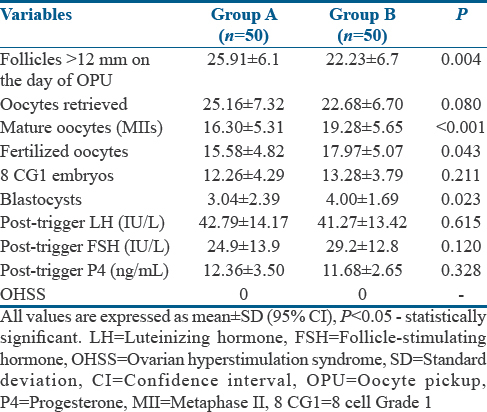 Post-trigger LH, P4, and FSH values, which were measured as a part of secondary outcome, would provide us insight about their predictability of oocyte maturity and empty follicle syndrome. However, further large studies would help us to define the appropriate cut-off post-trigger values to guide the clinicians and thereby rescue the cycle. Our study had some limitations. The sample size was small as this was aimed to evaluate a proof of concept. The study included relatively young nonobese PCOS women, and our results may not be applicable to obese women with PCOS. In addition, as the endocrine profile differs in normal and poor responders, the results of the study again may not be applicable in this set of population. Measurement of LH has inherent challenges including intersubject differences in basal LH, short half-life, and intrasubject diurnal fluctuation. Therefore, peak levels of LH may have been missed due to the short ascending limb of LH rise, lasting approximately 4 h after GnRHa trigger. The numbers were likely too small to detect significant differences in pregnancy outcomes, though a higher trend was observed with a repeat dose of GnRHa. Further, the reproductive outcome including the live birth rate is being collected and will be reported when available. A repeat dose of GnRHa 12 h following the first dose in PCOS undergoing IVF with antagonist provides a better cycle outcome than a single dose in terms of maturity of oocytes, higher number of blastocysts, and a trend towards improvement in clinical pregnancy. Though an increase in the study population and larger studies will allow us to confirm the significance of these preliminary findings, the current recommendation of two doses of GnRHa trigger 12 h apart should be further refined. Following the same line of thinking, the most appropriate dosing of GnRHa in PCOS should also be further determined. Our study also adds to the literature endorsing the routine use of GnRHa trigger in all PCOS patients undergoing IVF with freeze-all strategy for an OHSS-free clinic. The authors would like to thank all the postdoctoral fellowship students, consultants, and paramedical staff at Milann, The fertility center, for their invaluable support in generating this manuscript. Fauser BC, de Jong D, Olivennes F, Wramsby H, Tay C, Itskovitz-Eldor J, et al. Endocrine profiles after triggering of final oocyte maturation with GnRH agonist after cotreatment with the GnRH antagonist ganirelix during ovarian hyperstimulation for in vitro fertilization. J Clin Endocrinol Metab 2002;87:709-15. Emperaire JC, Ruffie A. Triggering ovulation with endogenous luteinizing hormone may prevent the ovarian hyperstimulation syndrome. Hum Reprod 1991;6:506-10. Kulikowski M, Wołczyński S, Kuczyński W, Grochowski D, Szamatowicz M. Use of GnRH analog for induction of the ovulatory surge of gonadotropins in patients at risk of the ovarian hyperstimulation syndrome. Gynecol Endocrinol 1995;9:97-102. Itskovitz-Eldor J, Kol S, Mannaerts B. Use of a single bolus of GnRH agonist triptorelin to trigger ovulation after GnRH antagonist ganirelix treatment in women undergoing ovarian stimulation for assisted reproduction, with special reference to the prevention of ovarian hyperstimulation syndrome: Preliminary report: Short communication. Hum Reprod 2000;15:1965-8. Engmann L, Siano L, Schmidt D, Nulsen J, Maier D, Benadiva C, et al. GnRH agonist to induce oocyte maturation during IVF in patients at high risk of OHSS. Reprod Biomed Online 2006;13:639-44. Engmann L, DiLuigi A, Schmidt D, Nulsen J, Maier D, Benadiva C, et al. The use of gonadotropin-releasing hormone (GnRH) agonist to induce oocyte maturation after cotreatment with GnRH antagonist in high-risk patients undergoing in vitro fertilization prevents the risk of ovarian hyperstimulation syndrome: A prospective randomized controlled study. Fertil Steril 2008;89:84-91. Humaidan P, Quartarolo J, Papanikolaou EG. Preventing ovarian hyperstimulation syndrome: Guidance for the clinician. Fertil Steril 2010;94:389-400. Humaidan P, Kol S, Papanikolaou EG, Copenhagen GnRH Agonist Triggering Workshop Group. GnRH agonist for triggering of final oocyte maturation: Time for a change of practice? Hum Reprod Update 2011;17:510-24. Griesinger G, Schultz L, Bauer T, Broessner A, Frambach T, Kissler S, et al. Ovarian hyperstimulation syndrome prevention by gonadotropin-releasing hormone agonist triggering of final oocyte maturation in a gonadotropin-releasing hormone antagonist protocol in combination with a “freeze-all” strategy: A prospective multicentric study. Fertil Steril 2011;95:2029-33. Honnma H, Hashiba Y, Asada Y, Endo T. Failure of triggering oocyte maturation with a GnRH agonist in polycystic ovary syndrome: Two case reports. Eur J Obstet Gynecol Reprod Biol 2011;157:239-40. O'Neill KE, Senapati S, Dokras A. Use of gonadotropin-releasing hormone agonist trigger during in vitro fertilization is associated with similar endocrine profiles and oocyte measures in women with and without polycystic ovary syndrome. Fertil Steril 2015;103:264-9. Bodri D, Guillén JJ, Galindo A, Mataró D, Pujol A, Coll O, et al. Triggering with human chorionic gonadotropin or a gonadotropin-releasing hormone agonist in gonadotropin-releasing hormone antagonist-treated oocyte donor cycles: Findings of a large retrospective cohort study. Fertil Steril 2009;91:365-71. ALPHA Scientists In Reproductive Medicine, ESHRE Special Interest Group Embryology. Istanbul consensus workshop on embryo assessment: Proceedings of an expert meeting. Reprod Biomed Online 2011;22:632-46. Kuwayama M, Vajta G, Ieda S, Kato O. Comparison of open and closed methods for vitrification of human embryos and the elimination of potential contamination. Reprod Biomed Online 2005;11:608-14. Ascoli M, Fanelli F, Segaloff DL. The lutropin/choriogonadotropin receptor, a 2002 perspective. Endocr Rev 2002;23:141-74. Yen SS, Llerena O, Little B, Pearson OH. Disappearance rates of endogenous luteinizing hormone and chorionic gonadotropin in man. J Clin Endocrinol Metab 1968;28:1763-7. Kol S. Luteolysis induced by a gonadotropin-releasing hormone agonist is the key to prevention of ovarian hyperstimulation syndrome. Fertil Steril 2004;81:1-5. DiLuigi AJ, Engmann L, Schmidt DW, Maier DB, Nulsen JC, Benadiva CA, et al. Gonadotropin-releasing hormone agonist to induce final oocyte maturation prevents the development of ovarian hyperstimulation syndrome in high-risk patients and leads to improved clinical outcomes compared with coasting. Fertil Steril 2010;94:1111-4. Hoff JD, Quigley ME, Yen SS. Hormonal dynamics at midcycle: A reevaluation. J Clin Endocrinol Metab 1983;57:792-6. Itskovitz J, Boldes R, Levron J, Erlik Y, Kahana L, Brandes JM, et al. Induction of preovulatory luteinizing hormone surge and prevention of ovarian hyperstimulation syndrome by gonadotropin-releasing hormone agonist. Fertil Steril 1991;56:213-20. Zelinski-Wooten MB, Lanzendorf SE, Wolf DP, Chandrasekher YA, Stouffer RL. Titrating luteinizing hormone surge requirements for ovulatory changes in primate follicles. I. Oocyte maturation and corpus luteum function. J Clin Endocrinol Metab 1991;73:577-83. Zelinski-Wooten MB, Hutchison JS, Chandrasekher YA, Wolf DP, Stouffer RL. Administration of human luteinizing hormone (hLH) to macaques after follicular development: Further titration of LH surge requirements for ovulatory changes in primate follicles. J Clin Endocrinol Metab 1992;75:502-7. Meyer L, Murphy LA, Gumer A, Reichman DE, Rosenwaks Z, Cholst IN, et al. Risk factors for a suboptimal response to gonadotropin-releasing hormone agonist trigger during in vitro fertilization cycles. Fertil Steril 2015;104:637-42. Devroey P, Polyzos NP, Blockeel C. An OHSS-free clinic by segmentation of IVF treatment. Hum Reprod 2011;26:2593-7. Youssef MA, Van der Veen F, Al-Inany HG, Mochtar MH, Griesinger G, Nagi Mohesen M, et al. Gonadotropin-releasing hormone agonist versus HCG for oocyte triggering in antagonist-assisted reproductive technology. Cochrane Database Syst Rev 2014;10:CD008046. Balaban B, Urman B, Ata B, Isiklar A, Larman MG, Hamilton R, et al. Arandomized controlled study of human day 3 embryo cryopreservation by slow freezing or vitrification: Vitrification is associated with higher survival, metabolism and blastocyst formation. Hum Reprod 2008;23:1976-82. Maheshwari A, Pandey S, Shetty A, Hamilton M, Bhattacharya S. Obstetric and perinatal outcomes in singleton pregnancies resulting from the transfer of frozen thawed versus fresh embryos generated through in vitro fertilization treatment: A systematic review and meta-analysis. Fertil Steril 2012;98:368-770. Strickland S, Beers WH. Studies on the role of plasminogen activator in ovulation.In vitro response of granulosa cells to gonadotropins, cyclic nucleotides, and prostaglandins. J Biol Chem 1976;251:5694-702. Eppig JJ. FSH stimulates hyaluronic acid synthesis by oocyte-cumulus cell complexes from mouse preovulatory follicles. Nature 1979;281:483-4. Yding Andersen C, Leonardsen L, Ulloa-Aguirre A, Barrios-De-Tomasi J, Moore L, Byskov AG, et al. FSH-induced resumption of meiosis in mouse oocytes: Effect of different isoforms. Mol Hum Reprod 1999;5:726-31. Imoedemhe DA, Sigue AB, Pacpaco EL, Olazo AB. Stimulation of endogenous surge of luteinizing hormone with gonadotropin-releasing hormone analog after ovarian stimulation for in vitro fertilization. Fertil Steril 1991;55:328-32. Humaidan P, Bredkjaer HE, Bungum L, Bungum M, Grøndahl ML, Westergaard L, et al. GnRH agonist (buserelin) or hCG for ovulation induction in GnRH antagonist IVF/ICSI cycles: A prospective randomized study. Hum Reprod 2005;20:1213-20. Oktay K, Türkçüoǧlu I, Rodriguez-Wallberg KA. GnRH agonist trigger for women with breast cancer undergoing fertility preservation by aromatase inhibitor/FSH stimulation. Reprod Biomed Online 2010;20:783-8. Kummer NE, Feinn RS, Griffin DW, Nulsen JC, Benadiva CA, Engmann LL, et al. Predicting successful induction of oocyte maturation after gonadotropin-releasing hormone agonist (GnRHa) trigger. Hum Reprod 2013;28:152-9. Shapiro BS, Daneshmand ST, Restrepo H, Garner FC, Aguirre M, Hudson C, et al. Efficacy of induced luteinizing hormone surge after “trigger” with gonadotropin-releasing hormone agonist. Fertil Steril 2011;95:826-8. Quintans CJ, Donaldson MJ, Blanco LA, Pasqualini RS. Empty follicle syndrome due to human errors: Its occurrence in an in-vitro fertilization programme. Hum Reprod 1998;13:2703-5. Mesen TB, Yu B, Richter KS, Widra E, DeCherney AH, Segars JH, et al. The prevalence of genuine empty follicle syndrome. Fertil Steril 2011;96:1375-7.